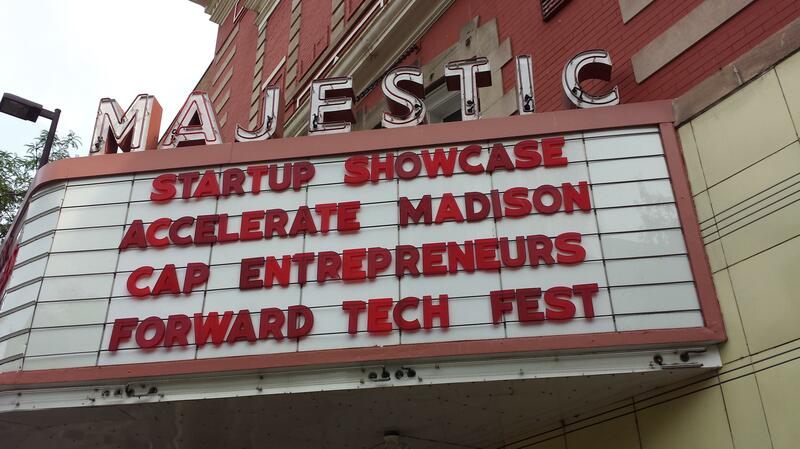 The 2014 Forward Festival Startup Showcase will put Madison's top startups on the big stage at the Majestic Theatre. Join us on Wednesday, August 27 from 5-8pm for an exciting evening of networking and presentations. This event is complete. Thank you for attending! 900dpi, Deneb Outdoors, IRISTOCRACY, HealthMyne, Dock Technologies, CleMetric, Forkforce, Digsite, MobCraft, and Bankmybiz. We've also invited back the startups who presented last year to give 1 minute quickfire updates on their progress. You'll hear exciting updates from: PerBlue, HealthFinch, Networked Insights, Abodo, MobileIgniter, Ronin Studios, Quintessence Biosciences, Drifty, Murfie, EatStreet, and Propeller Health. The Startup Showcase is presented by Capital Entrepreneurs and Accelerate Madison. EVENT TICKETS: A limited number of tickets are now available ($20 - includes 2 drink tickets and taco buffet). Startup Showcase event admission is included for all Forward Technology Conference attendees and Forward Pass holders. Features taco buffet and 2 drink tickets for all attendees! Features presentations from 10 new startups and quickfire updates from past presenters. Includes 15 min intermission.